One for you, two for me. 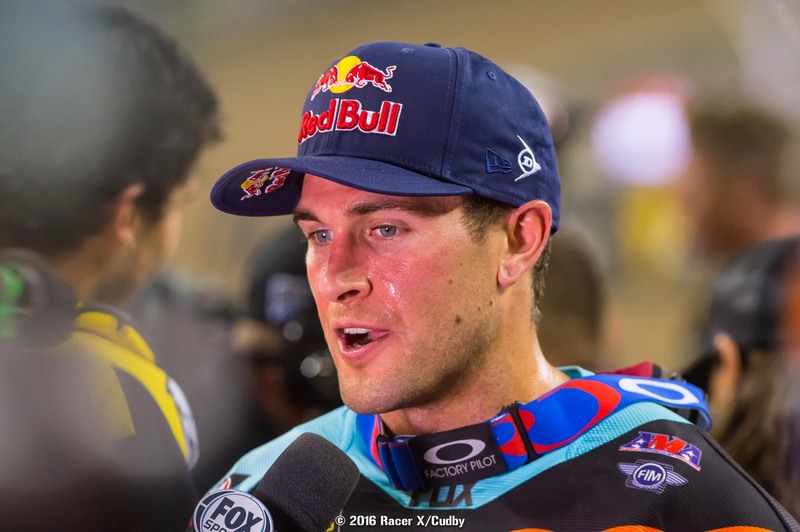 Lately some other riders have broken through in Monster Energy Supercross to get wins, but for each victory they reel off, Red Bull KTM’s Ryan Dungey makes certain to get his share, as well. After Eli Tomac and Ken Roczen struck gold in Daytona and Toronto, Dungey regained control with a solid win in Detroit, his sixth in eleven rounds this year. Most riders commented on how slick the track was….. Wait, Dungey didn’t win? In the end, he did not! He took the checkers first but was protested and penalized two positions for jumping though a section of the track were red cross flags were displayed. This moved Jason Anderson from second to first, giving the Rockstar Energy Husqvarna rider his second win of the season and his career—and this is also the first time any of us can recall something like this happening! As mentioned, the course was slick, and that fell into Dungey’s hands. The slickness was clear in the corners, but even more so in the whoops, which also featured a tricky corner as an entrance, and a strange gap after the first few whoops. Then the whoops started getting beat up and cupped out, as well as slick, so it became very tough to get through them consistently. That’s what Dungey did, though. After a brief bobble early that allowed his teammate Marvin Musquin to sneak by him for the lead, Dungey dialed those whoops on lap two to take the lead. He was solid from there. Musquin wasn’t quite able to hold Dungey off like he did a few weeks ago in Atlanta, but his still rode well and looked to have second in the bag. 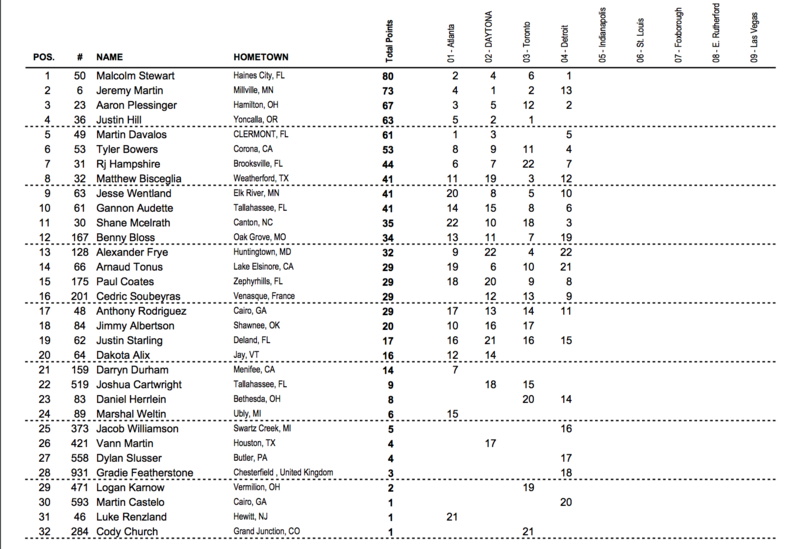 Anderson started decently in fourth, but by the time he cleared BTOSports.com KTM’s Justin Brayton he already had a gap to Dungey and Musquin. He rode well though, pretty much matching the pace of Dungey, and closing slightly on Musquin. But Musquin had enough of a gap to hang on until the 19th lap. Anderson snuck by for second—which ended up giving him the win after Dungey was penalized! For what it’s worth, our Jordan Roberts happened to run into Anderson at the hotel after the race, and Anderson basically said, “Yeah, apparently I won!” We’ve heard the protest on Dungey was not filed by Rockstar Energy Husqvarna or Anderson, but by another team that actually wasn’t even impacted in the results. Heartbreaker for Musquin, who was actually two laps away from his first career 450SX win (by running second) until that crash with a lap and a half to go. Also a heartbreaker for Brayton and Blake Baggett, who were headed to strong finishes before flat tires did them in (two weeks in a row with some flats in supercross). Brayton held off Monster Energy/360fly/Chaparral Yamaha’s Chad Reed in fourth for 14 laps until his rear tire went down, forcing him to the mechanic’s area. At the same time, Baggett, who has had a miserable, injury-plagued season, was in seventh when he also got a flat. Reed held on for a solid fourth, he was pretty quick throughout the evening but didn’t get the starts he probably wanted. Canard had a crash while trying to pass Baggett for seventh. He recovered for eighth. In front of him came Autotrader/Monster Energy JGR Yamaha’s Weston Peick with a season-best seventh. Congrats out to SmarTop MotoConcepts Mike Alessi for a solid top ten in ninth. GEICO Honda’s Justin Bogle rounded out the top ten. 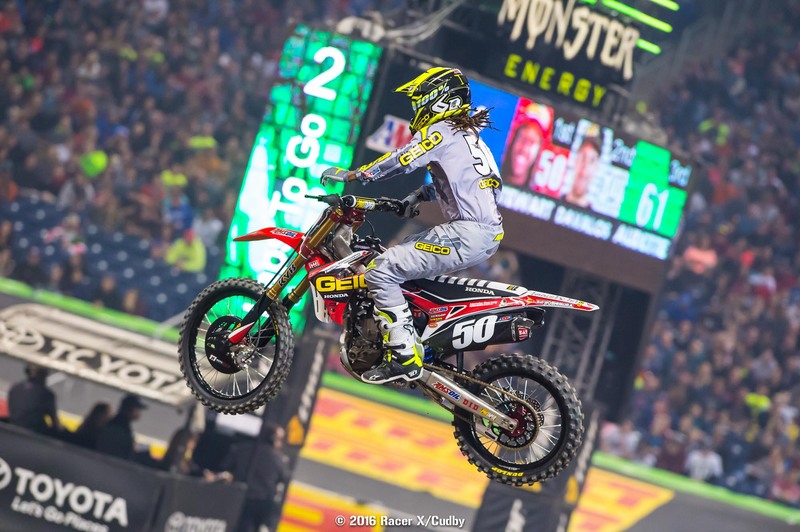 As crazy as this race was, it can’t overshadow the forever-nutty 250SX East class, which went through a few more shakeups. First, last week’s winner Justin Hill crashed out for the evening in practice, we heard he hit his head. This put the focus on series’ leader Jeremy Martin, but JMart crashed in turn one for the second race in a row, then crashed again trying to come through the pack on a twisted Yamalube/Star Racing Yamaha. He stopped in the pits to straighten everything out, and could only recover for 13th. Tonus (66) and Plessinger (23) enjoyed good starts. Tonus crashed out, Plessinger finished second. GEICO Honda’s Malcolm Stewart should have been best positioned to take advantage, but he was fighting an illness all day. Well, we can indeed say he was sick, because he ripped in his heat and the main event to take his first victory of the season—and thanks to Hill and Martin’s troubles, he vaulted into the points lead! Aaron Plessinger had the early lead in the race, but Stewart blew by him with incredible whoop speed and never looked back. Sick or not sick, Malcolm was sick. Plessinger’s start was his first good one of the season, and second place gave him his first podium. Troy Lee Designs/Red Bull KTM’s Shane McElrath, who came into the season fresh off an injured wrist, took his first podium of the season in third. Amazingly, Monster Energy/Pro Circuit Kawasaki’s Tyler Bowers was down in the first turn with Martin but clawed all the way back to fourth! Bowers used his arenacross experience to sneak through early—he was 19th, 15th and then 11th after three laps. Behind him came Rockstar Energy Husqvarna’s Martin Davalos, who was the points leader in 250SX East eight days ago, but missed the race in Toronto due to travel visa issues. Stewart now holds a nine-point lead over Martin, Plessinger is third, and Davalos went from 20 points down to 19. 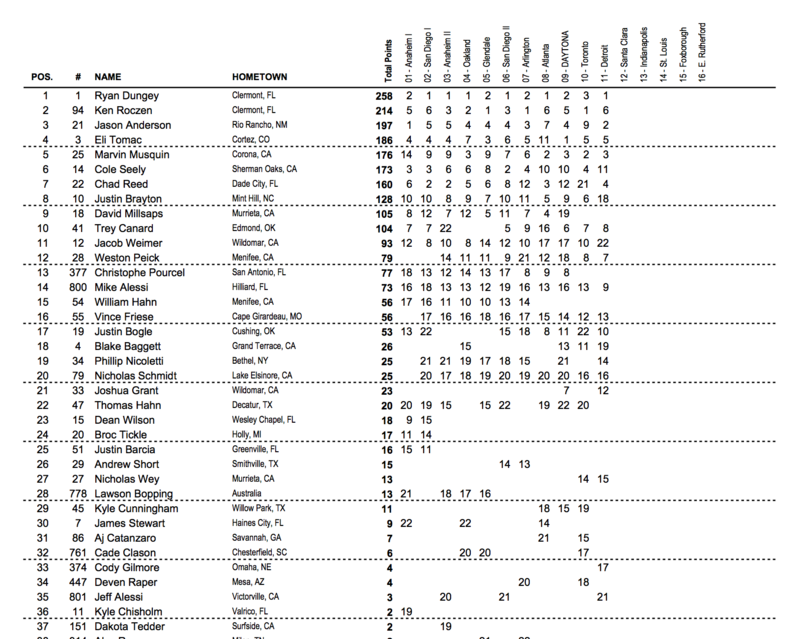 Dungey Penalized : Results adjusted ! The 450 main, while not quite as crazy as its 250 counterpart, had its share of intrigue. Ryan Dungey, using the same inside line as he used in the heat, grabbed the early lead. His KTM teammate Marvin Musquin made a quick move, trading paint with his training partner. Dungey was quick to adjust, though, and passed Musquin back on lap two. That was pretty much all she wrote up front, as Dungey stretched his lead to just over six seconds at checkers. But… there was some other happenings. Ken Roczen, Trey Canard and Eli Tomac—all fast throughout the day—were buried off the start. Cole Seely made a big mistake early in the race and went over the Tuff Blocks in the corner. While Dungey was running away from Musquin, Justin Brayton was holding down fourth for much of the race over Chad Reed before he exited with a rear flat tire. Blake Baggett would also experience the same fate. Josh Grant and Jake Weimer also went down at some point, with Weimer unable to finish. Musquin would fall late in the race and give up second to Jason Anderson, with Reed in fourth. Tomac would work back to fifth, with Roczen right behind him. Weston Peick took seventh. Meanwhile, Canard got together with Baggett (before Blake’s flat) and went off the track. He would still finished eighth somehow. Mike Alessi and Justin Bogle rounded out the top ten. 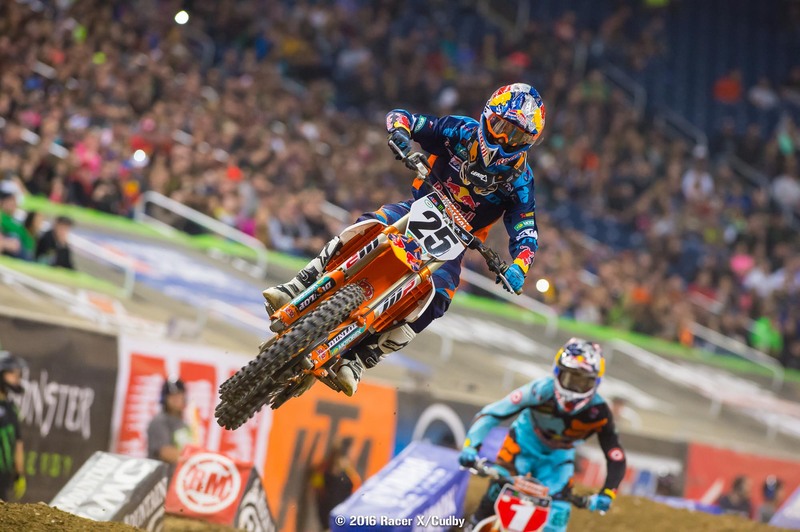 Dungey's win marks his 27th straight podium in supercross -- a record -- and his sixth win on the season. 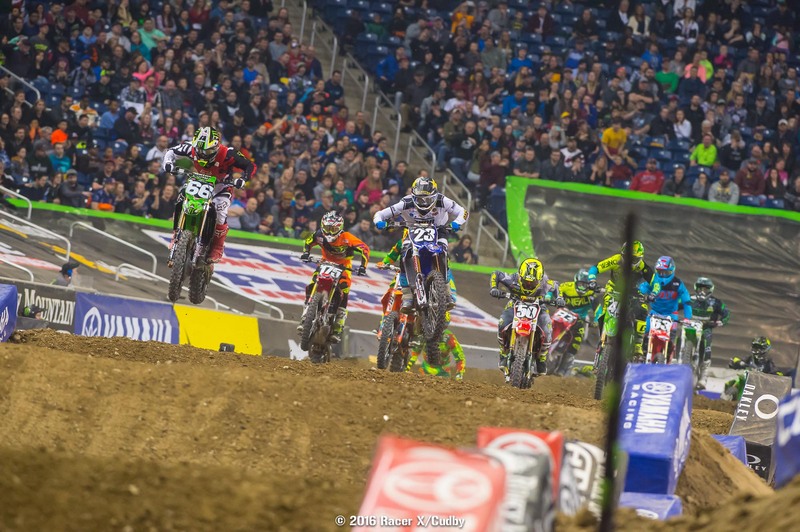 Can the 250SX East Region get any crazier? No, no it can’t. Let’s start from the beginning. Martin Davalos, who was leading the points at the time, missed Toronto last weekend due to visa issues. Jeremy Martin finished second—after a crazy first turn pileup—and took over the points lead. Justin Hill, last week’s winner and second in points, went down hard in practice earlier today and missed the main. Okay, now that we’re all caught up, let’s get to the main event. Arnaud Tonus grabbed the early lead, but chaos was going on behind. Jeremy Martin and Tyler Bowers tangled and went down. Martin Davalos was also caught up in the first turn. 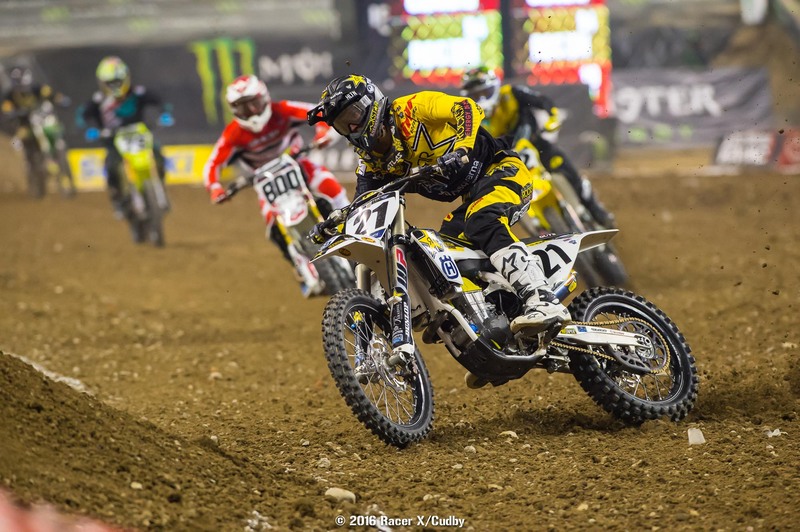 Malcolm Stewart was third behind Aaron Plessinger. Stewart got past Plessinger and then Tonus, who went down in the whoops and did not finish the main. Martin was charging through the pack, just like last week, but washed the front end. Eventually he had to go to the mechanics area and finished thirteenth. Oh, and he went a lap down in the process. He is now down 7 points to Stewart. Malcolm, who is sick (did we mention that? 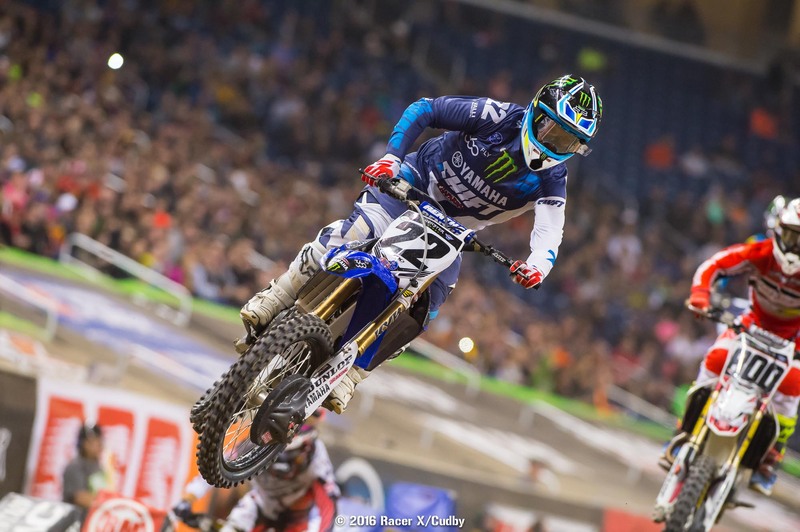 ), ran away from Plessinger to take the win—and the points lead. Meanwhile, Davalos worked his way back to fifth—and got right back into the championship chase. Plessinger would finish second. Oh, and we never even mentioned Shane McElrath, who looks to be back on track after off-season wrist surgery, who finished third for his first podium of the season. Bowers and Davalos would round out the top five. Gannon Audette, RJ Hampshire, Paul Coates, Cedric Soubeyras and Jesse Wentland would round out the top ten. We're back in Detroit for the third consecutive Monster Energy Supercross at Ford Field, and to no surprise, it's cold in the D. The pits are packed tight and the privateers are pitted inside along with the addition of the Monster Energy/Pro Circuit Kawasaki team. They're the only factory team that opted to pit inside this year. Martin Davalos is back, albeit without the red plate. Jeremy Martin is now sporting the red background and points lead on his Yamalube/Star Racing Yamaha. The dirt was pretty tacky on track walk earlier, but it will likely dry out completely after a couple practices. As an homage to the old Pontiac supercross, the track goes back into the stands this year and has a high speed exit that send riders down an 80-yard stretch. There's an atypical whoop section that runs the full length of the field and is split by 10-foot flat section. There's an opportunity to quad over a step-on step-off, but we'll have to wait a few practices to see if it has an ample payout. Darryn Durham and Tyler Bereman were [likely] joking about doubling from a roller over the corner and down-siding the wall jump. Remember those poles they used to put in the corners to combat creative lines?